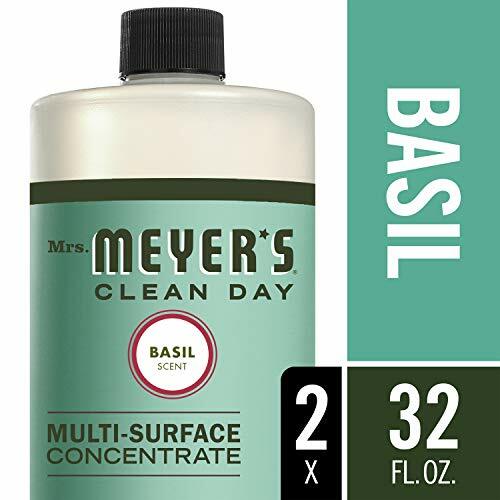 Mrs. Meyer’s Clean Day Multi-Surface Concentrate features gentle yet strong cleaning agents, while also providing a special, singular scent for your entire home. Basil has a cool, crisp scent that is uplifting & grounding, familiar & exotic – all at one time. Such an inviting herbal smell, the garden's friendly boost of green. This garden-fresh scented multi purpose cleaner effectively cleans non-porous multi-surfaces such as floors, counters, and surfaces in bathrooms, kitchens or any room both inside and outside. This biodegradable cleaner is concentrated and hard-working. It contains plant derived and other thoughtfully chosen ingredients. Made without parabens, phthalates, animal derived ingredients and always cruelty free. Requires dilution for use.Available in other garden inspired scents and biodegradable products such as dish soaps and laundry detergents! Mrs. Meyer’s – rooted in goodness.